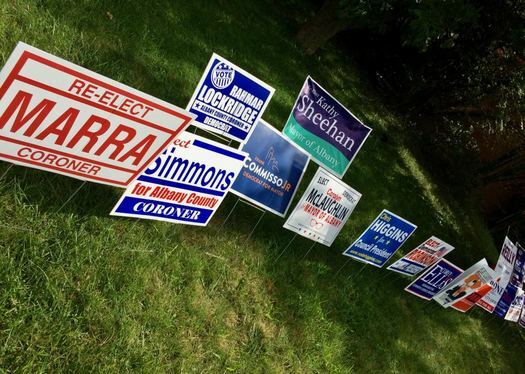 Maybe you've passed by that yard on Hackett Boulevard in Albany that's full of campaign yard signs. It's become an annual tradition. And we gotta admit it's something we look for, kind of like the house in the neighborhood that really goes all out for each Halloween. This year all the candidates gave me their signs willingly. I even have some signs you haven't seen elsewhere around the city, such as the Mark Robinson lawn sign and the Lockridge for Coroner sign, as far as I know. After the September primary, I'll take down the signs for the people who lost and put up signs for the other candidates running in November. Who knows who is running for state Supreme Court? Peter Crummey of Colonie (R) and Julian Schreibman of Kingston (D). Julian will be bringing his lawn sign up to Albany to add to the fun. Politics really is Albany's favorite sport.